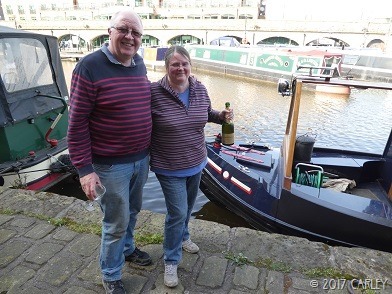 As we haven’t had a launch as such we have decided to have several celebrations on our cruise to Crick. 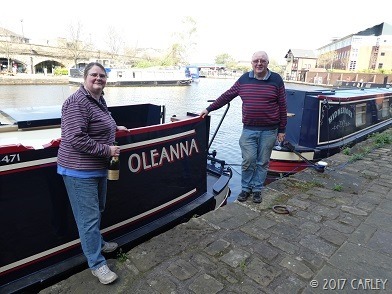 After spending Saturday shopping and tidying up we had the first guests on board Oleanna. Friends, Steve and Frank, drove down from Scarborough to spend the afternoon with us. After plenty of chatting inside over cups of tea, sausage rolls and boat biscuits we went outside to officially give NB Oleanna her name. 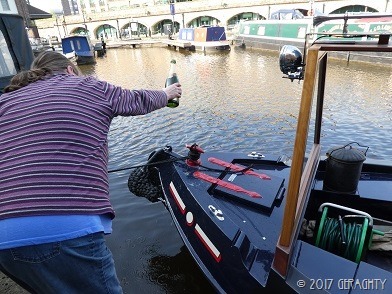 A 1979 bottle of Bollinger champagne was opened and then poured over the bow. Sadly we already knew that this vintage bottle would be undrinkable but it was a suitable bottle for the job. We then opened a bottle that Frank had brought with him to toast Oleanna, it didn’t take long to finish it! Steve and Frank were both impressed with her. Frank a skilled carpenter by trade gave the woodwork a big thumbs up. We now have the Matthews seal of approval. We’ll be happy to stop and share some bubbles with people on our cruise south. This entry was posted in Uncategorized on 11th Apr 2017 by pipandmick.